The Blue Rhythm Boys bring authenticity, originality and joy to their own swinging mix of hot jazz, country blues and hokum. Their love of the great, acoustic string bands of the last century shines clear and strong. You'll hear music from the 1920's & 30's; a raucous repertoire featuring songs from Mississippi John Hurt, Blind Blake, Washington Phillips and Pink Anderson as well as the "hot club" swing of Django Reinhardt, the western swing of Bob Wills & The Texas Playboys, and the thrilling music of Slim & Slam, Hank Penny and the great Fats Waller. 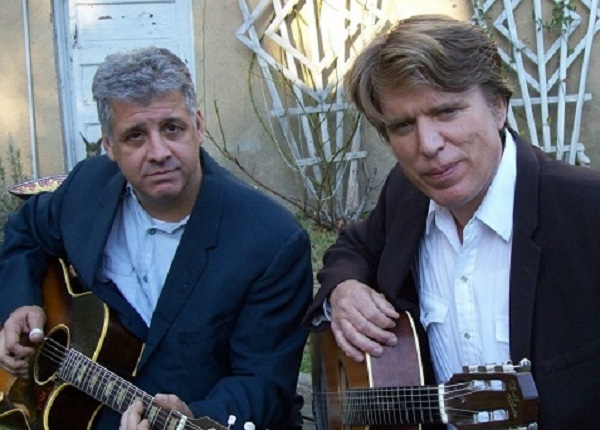 The Blue Rhythm Boys feature Tom Mitchell, a guitar player and singer rooted in the styles of the 1920’s and 30’s jazz, western swing, country blues and old-time music. He has happily been both sideman and leader for a great variety of musical endeavors. In addition to singing and playing guitar, he’s played mandolin, banjo, tenor guitar or tiple when the need arose. Ten years of playing with legendary hipster Dan Hicks & His Hot Licks took him around the world and led to the recording of two acclaimed CD’s including“Beatin’ the Heat” which featured guest appearances by Bette Midler, Ricki Lee Jones, Tom Waits, Elvis Costello, and Brian Setzer. Also featured in The Blue Rhythm Boys is Jim Stephanson, a guitarist of great renown and a singer of soulful bearing, a treasure in the Washington DC roots music scene. Jim’s unique guitar style draws on the influences of Chet Atkins, Danny Gatton, Les Paul and Mississippi John Hurt. The Washington Post says: "Washington DC can lay claim to a heritage of great electric guitar players; Jim Stephanson is part of that great legacy. In 2010 Jim released his first solo album of original roots rock music entitled "Say Go". NRBQ fans take note: Say Go was co-produced by Terry Adams, who also plays piano, clavinet and organ on the recording and Joey Spampinato (who also adds harmony vocals). The rhythm section on the entire disc is the incomparable team of Tom Ardolino and Joey Spampinato. Original NRBQ guitarist, the late Steve Ferguson, solos on “Make a Lot of Noise” in what turned out to be his last recording session.